Only a few days left until I am taking off to Punta Arenas in Chile from where I will take you on a new science adventure. 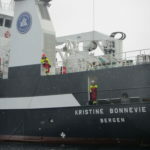 Me– that’s Nadine, Elin’s PhD student, I will be on the ocean for seven weeks and explore Dronning Maud Land, the Norwegian territory in Antarctica, together with scientists from different marine science disciplines. The area is far away from any civilization and the transit from Punta Arenas takes about 11 days. At the moment, I am arranging the last details for the travel and the suitcase is slowly filling up. What’s in there? A warm working suit, safety shoes, gloves, hand warmers, sea sickness medicine, chocolate, an ebook reader stuffed with books, movies, a camera, my computer and most important, Maudy my mascot! 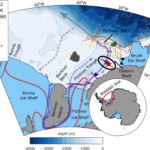 The instruments that we’ll use are already sent down, among them a mooring (long chain of instruments) that will be anchored at the ocean floor in front of Fimbul ice shelf. 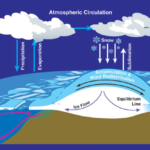 In two years, we will hopefully be able to get back there to pick up the instruments full of data that tell us what influences ice shelf melt, ocean currents, changes in water masses with time and much more. 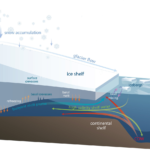 The other scientists on board will be looking at sea ice, mammals, fish, benthos, zooplankton and micronekton. What this all is? To be honest, I am not so sure myself, but I have a lot of time to find out and I will keep you posted. You can follow my stories about the area, the measurements, the life on board here or on twitter (@DareliusElin) and facebook (EDarelius&Team) during the next weeks. Hopefully there will be some nice pictures of penguins and ice bergs! 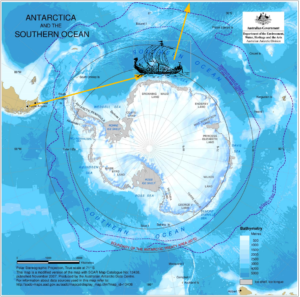 Antarctica map with the research area marked with the ship. We will sail from Punta Arenas in Chile and back to Cape Town in South Africa. 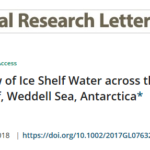 ← First paper from our Amundsen moorings published!